60 years ago this week, the Hungarian people rose up against the Stalinist government of Hungary and the Soviet occupation. The revolution ultimately failed, and in the wake of it, my wife’s father, Ferenc, fled Hungary along with some 200,000 people, and became a refugee. Ferenc was able to escape across the border into Austria along with a friend thanks to the help of a local villager who helped them navigate the minefield at the border. Unfortunately they later received news that this man had been caught and executed. Those who fought and those who fled were known as 56-ers (Ötvenhatosok). Time magazine named the Hungarian Freedom Fighter the Man of the Year in 1956. The revolution began on October 23, 1956 with rallies and protests. When the ÁVH (Hungarian secret police) fired into the crowd of protesters in front of the parliament building, people formed militias, armed only with rocks and molotov cocktails, but were later able to break into military weapon storage and get guns. The revolution spread throughout the country, and on Oct 28, 1956 Soviet troops withdrew from Budapest. The Hungarians thought they were free, and began to establish a new government, but on Nov 4, in the middle of the night, the Soviet army rolled into Budapest and crushed the revolution completely and finally. One of the saddest parts of the story of the revolution, was that the United States had been broadcasting into the Eastern Block via Radio Free Europe, telling people there that if they were to rise up against the Soviets, the US would support them. Unfortunately, that didn’t happen, because at the exact time when the Hungarians did rise up, the US was in the middle of negotiations about the Suez Canal and needed the support of the Soviet Union, and they weren’t prepared to turn the Cold War into World War III. My father-in-law, Ferenc, was able to get refugee status in Austria and petitioned for asylum in the United States, and was among those who were accepted. The United States said they would accept 100 young men who were willing to work. They took them on a B-52 Liberator, and after a stop-over somewhere in Africa, they were brought to a military base in New Jersey. Asked where they wanted to live in the United States, they chose Chicago, because it was the only American city they had heard of. Ferenc later gained US citizenship, got married and had 2 kids. He went to college and worked in the tech industry. He loved Hungary, but understood he couldn’t go back. He also loved America, because of the opportunities and the freedoms he enjoyed here. It was also in the United States that Ferenc heard the Gospel of Jesus Christ and became a Christian. He was born in Hungary during World War II and raised in the Stalinist era of communist Hungary, which meant that although he identified as Roman Catholic, he never practiced it. Upon coming to the US, Ferenc began attending Catholic mass, but the real turning point in his life came when his son, my brother-in-law, was invited as a teenager to a church by some friends. My wife and her brother had gone to Catholic church growing up with their parents, but as they got older they had stopped attending. Tony, my brother in law embraced the gospel message of who Jesus was and what he did: the Divine Son, dying in our place, for our sins, so we could be forgiven, justified and redeemed; rising from the dead that we might have eternal life through him. Tony invited Rosemary, my wife, to come to church with him, and she did. He also invited his mom and dad, who were much more hesitant to come because of the charismatic nature of this particular church. Ferenc, however, listened to what Tony said about Jesus, and so Ferenc looked for a church where he felt comfortable going and learning more. He ended up finding Calvary Chapel in Vista, CA – and Rosemary began attending with him. Ferenc attended Calvary Chapel in Vista for years. While he attended there he met another man, István, who was also a 56-er. About this time, the great changes were taking place in Eastern Europe which led to the end of Communism in those countries. Calvary Vista led the way in sending teams to preach the gospel and to plant churches, first in Yugoslavia and then in Hungary. Ferenc was so excited to see what God was doing, and he wanted so badly to go to Hungary and tell his fellow countrymen the good news of the gospel, and the message that God loved them and that Jesus had died for them. Unfortunately, he never got that opportunity. Ferenc suffered from Juvenile Parkinson’s Disease, a devastating condition for a man who had formerly been an avid athlete and soccer player. Ferenc died from complications from Parkinson’s in 1996, at the age of 59, but not before seeing his daughter go on mission trips to Hungary. His friend István did go to Hungary and spent years working with Calvary Chapel in Budapest. In 1998, Rosemary moved to Hungary to work with Calvary Chapel, spreading the gospel and planting churches. It was there that I met Rosemary in 2001. We ended up working together in, of all places, a refugee camp, in Debrecen, Hungary where we ministered several times a week to people mostly from muslim countries, who had never heard the gospel of Jesus Christ. We provided for them materially through donations, and we also offered them Bibles and held Bible studies, translated into several languages. Over this period of time, we saw people from Kosovo, Iran, Afghanistan and several African countries become Christians after hearing the gospel clearly presented for the first time in their lives and having the opportunity to read the Scriptures for themselves. Today, we have a modern-day refugee crisis. We’ve been told that they are a “Trojan Horse” – and maybe some of that rhetoric has some truth to it, but I also know that people were sceptical of people like Ferenc, my father-in-law, who came from a Communist country – and guess what: during the Cold War, some spies and people with bad intentions against America did come to the US pretending to be refugees. It doesn’t change the fact of Ferenc and many other refugees’ stories of escaping oppressive regimes and not only finding freedom, but also having the opportunity for the first time in their lives to hear the life-transforming message of the gospel. I see the current refugee situation through this lens: the lens of my wife, her brother and my late father-in-law. I see it through the lens of the many people who became Christians in the refugee camp I worked in, who had never had the opportunity to hear the gospel or the freedom to become Christians in their home countries. I see it through the lens of the Iranian refugees I met in Budapest last year, whom White Fields church bought Bibles for, because they were hearing about Jesus and getting baptized, changing their names and evangelising other refugees. I’m not afraid of refugees – my father-in-law was one. The mass exodus of people from Syria is a difficult and messy situation, but here’s what I’m going to do if Syrian refugees move into my neighborhood: I’m going to befriend them, love them, show them kindness and seek to share with them the life-changing message of the gospel, a message which they likely have never heard before. I hope you’ll do the same. I read this interesting report from the Financial Times on the rise of Christianity in China. There are now about 100 million Christians in the world’s most populous nation, eclipsing the 86.7 million-strong membership of the ruling Communist party. Christianity (particularly the Protestant variety) has been the big winner in the competition for Chinese souls. If it continues to spread at its current pace, the country is very likely to be home to the world’s largest Christian population within the next 15 years. The truth is that, as this article reports, for all the news of the decline of Christianity in Europe, Christianity is still spreading quickly around the world, particularly in the developing world. These are exciting times! 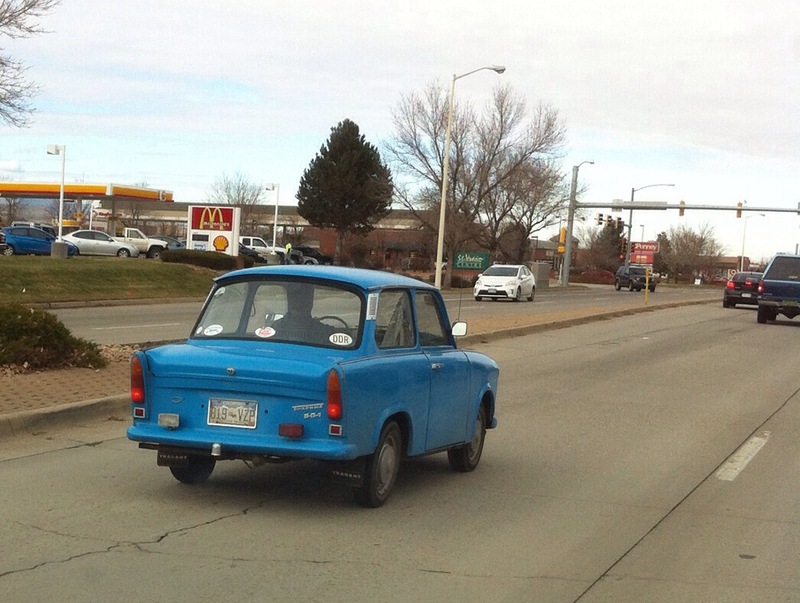 I spotted this Trabant car on Hover street in Longmont today. If you aren’t familiar with the Trabant, it is a masterpiece of East German engeneering, still common on the roads of Eastern Europe. The Trabant was the true “people’s car” for those in the eastern block. 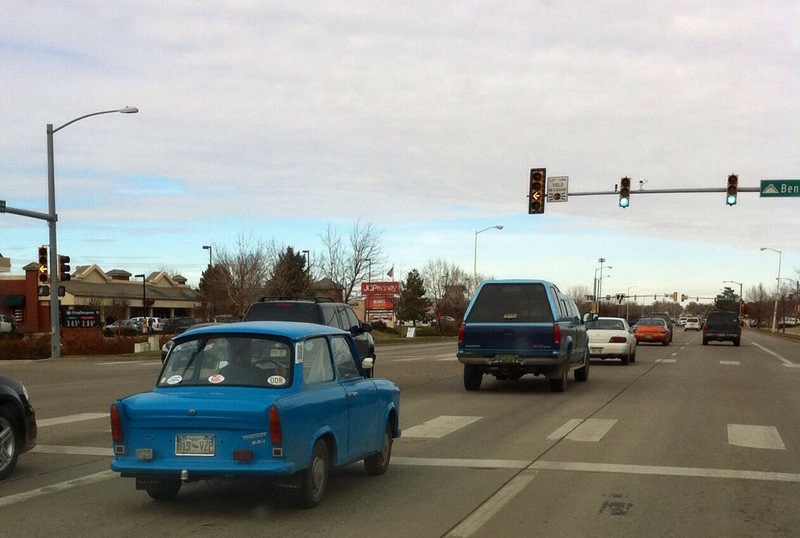 This is only the second time I’ve seen one in the US, and the first one I saw didn’t run – this one seemed to run well and had Colorado plates – and a DDR sticker on it. I’d be curious to know the story behind how this guy got it over here.